So I spend way too much money on clothes that are barely adequate, stuff them all in my too-small huge suitcase, and spend the entire conference in a state of panic/misery due to my feeling uncomfortable in the clothes I have to wear. For some reason, this time around I’m good. I didn’t buy clothes for conference. Nor did I buy new shoes just before conference (to buy new shoes just before you stand for five days straight is not a good thing, in case you were wondering). What I did do is put together an entire outfit for each day of the week, not including travel days. Then – no joke – I labeled each outfit for the day I’m going to wear it. Packed each outfit, layer by layer. Added underwear, sox, jewelry, shoes. Everything’s now packed for those important days, and I still have room in my suitcase. It’s a lovely feeling, because I always come home with more stuff than I leave with; having extra room in the suitcase lowers the possibility that I’ll be over the weight limit on the return flight. But extra room makes me nervous. Which means, of course, that I’ll need to add some pieces for the nights, and extra tops. Just in case. My dragon needs a name. He’s going a-courting Lady Dazzleton, a lovely tutu-wearing dragons (companion to Tameri Etherton) that he’s seen about on the interwebs. …This year, I’m not panicking. Not panicking at all. Hoping to be able to shout from the rooftops my news soon. In the meantime, have a safe and happy week! If you have a name for the he-dragon in the photo, fling it to me in the comments! 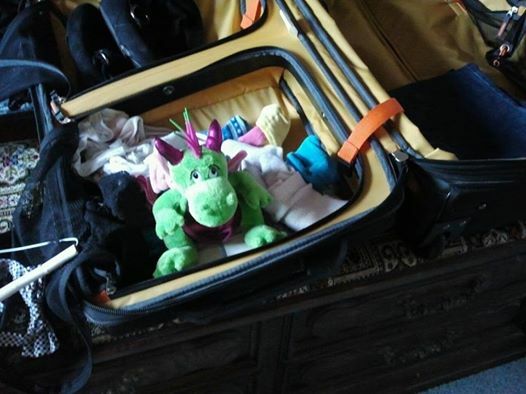 This entry was posted in Life, Writing and tagged Christine Ashworth, dragon, Lady Dazzleton, packing panic, RWA National Conference, San Antonio, Tameri Etherton, writer. Bookmark the permalink. Lightweight, yet layered for those chilly hotel meeting rooms, right? Sigh…I have sunscreen. Also packed my swimsuit – gotta get a dip in the pool this time. Can’t wait to see you, Rachel! It’s crazy-making isn’t it? My biggest problem is getting up early enough and being awake enough to drive the forty minutes to the airport. Almost every summer that I travel I find early morning road closures or road work. They start early in the desert because of the heat. Always an adventure. Anyway, for the past week I’ve set my alarm back by 15 minutes each day. This morning I got up at 4:50 am, with no problem. I did a dry run. You know, this has greatly reduced my anxiety. It might even be a good plan. Ha ha. See you in Texas. Can’t wait to hear your news! Roben! I woke up at 4am this morning, which was perfect since Lynne is picking me up at 4:50am tomorrow. Crazy stuff! Can’t wait to see you! WOO! Roben, I can whisper it in your ear…but that’s about all until it’s official! HUGS!!! Don’t forget to toss a few band-aids into your luggage, & your cell phone charger! Woo! I’ve got my cell charger – carrying it with me onto the plane, lol! HUGS hon! See you there soon! Algernon is a good name for a cute, smart, and companionable he-dragon! Gail, bless you. Algernon it is! Thanks! I wish I was going, BUT..I’m so glad I’m not going. Conferences are so much fun, they wipe me out for days. I have a feeling this one would take weeks to recover from! Julia, come to RWA 2016 – San Diego! Not so far to travel. It’s a FABULOUS conference – you must try it at least once!